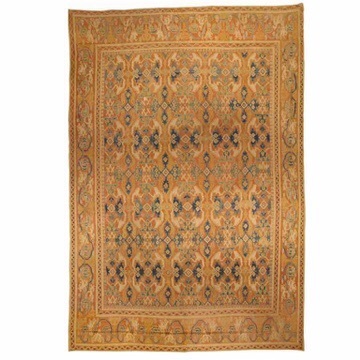 Before beginning this blog on rugs, carpets and tapestries I had never heard of Spanish rugs. Had you? 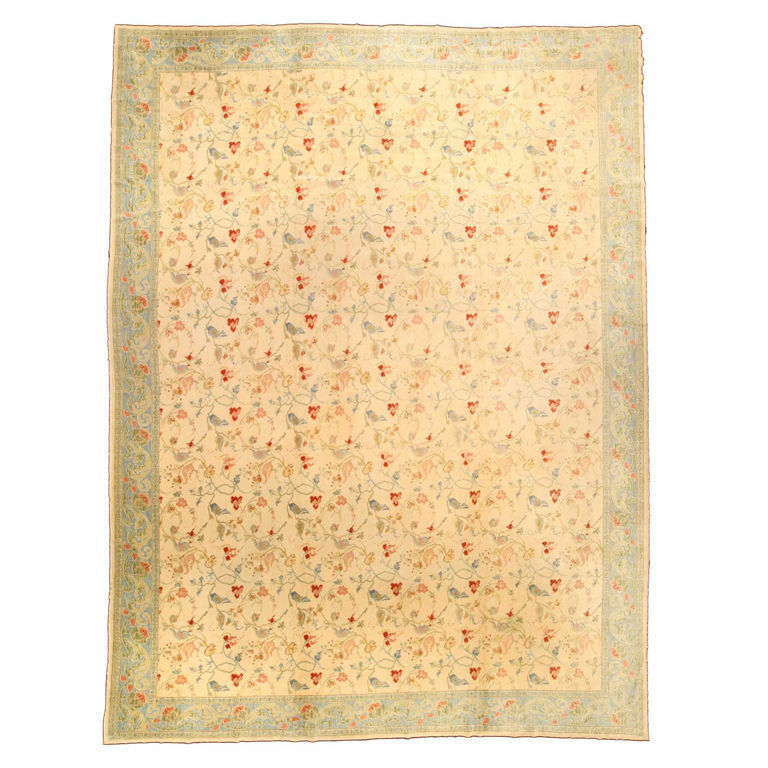 Apparently though, rugs have been woven in Spain since well before the first Muslim conquest in the early 8th Century. Muslim, Gothic and Jewish influences combined to make a very culturally diverse rug. 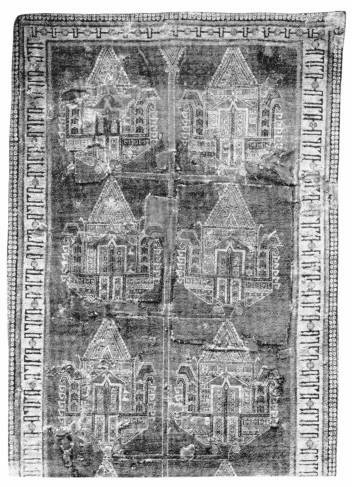 The oldest known Spanish Rug, called the Synagogue Rug, was woven in the 14th Century or earlier. It is called the Synagogue Rug because of its Torah motif. Presumably it was produced for or by Jews. The image of this Synagogue rug on the left is from the Pergamon Museum in Berlin. Unfortunately, after the Muslim Arabs, Berbers and the Jews were expelled these lovely rugs lost some of their distinctive multicultural flavor. 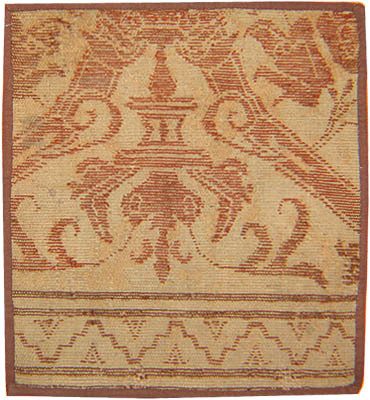 The image to our right displays a fragment of an Alcaraz carpet from Spain in the 16th Century. Described on the Nazmiyal Collection website as “a lovely acanthus vine scroll pattern in a classicizing Renaissance style of the type that evolved in the period following the Reconquista under Ferdinand and Isabella. The geometric border, however, still harks back to the Moorish past in which carpet weaving originated in Spain.” For those of you not familiar with Spanish history (and that includes me), the Spanish Reconquista ended upon the fall of Granada, the last Muslim stronghold on the Iberian Peninsula, in 1492 (something else about that date, 1492, that rings a bell…). As you might imagine, with the Reconquista and the expulsion of the Jews, Spanish rugs lost some of their Eastern flavor and began to look more like the rugs already in production in Europe, France in particular. To our left is a Spanish rug from the 18th Century. Looking at it with my admittedly uneducated eye I can see that this later rug is more decorative than interesting. Not to say it isn’t a very fine rug. And you can pick it up online at 1stDibs for $100,000 if you’re looking for that perfect carpet on your dining room floor. Most of the reading I do on rugs, carpets and tapestries tells me that the 19th Century saw a decline in the quality of hand-made rugs. Apparently the arrival of synthetic dyes and greatly increased European demands for rugs brought an end to rug-making traditions across the globe. The synthetic dye, while cheap and easy to make, didn’t age well and smelled bad. Markets,not traditions became important and production increased while quality declined. It’s the old story of the Connoisseur vs the Consumer. Since my relative ignorance leaves me still at the Consumer level I find I really like some of the modern Spanish rugs. The image below, of a Spanish rug from 1940 on sale at 1stDibs looks darn good to me. It looks…interesting again like its 13th Century ancestors.